On August 24, 2016 at 03:36 a 6.0 magnitude earthquake (Richter scale) struck central Italy, killing about 297 people. The most affected area by the earthquake were Amatrice, Accumoli and Pescara del Tronto. According to the experts of the National Institute of Geophysics and Volcanology (INGV) to cause the earthquake was the "stretching" of the Apennines, namely its extension process from East to West. 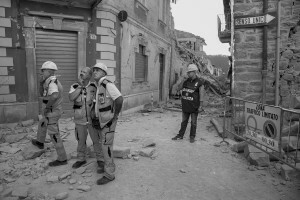 LAZIO, ITALY – AUGUST 24: Rescuers search for victims in the rubble after a strong earthquake hit Amatrice on August 24, 2016. Italy was struck by a powerful, 6.2-magnitude earthquake in the night, which has killed at least 297 people and devastated dozens of houses in the Lazio village of Amatrice. LAZIO, ITALY – AUGUST 24: Collapsed buildings are seen after a strong earthquake hit Amatrice on August 24, 2016. Italy was struck by a powerful, 6.2-magnitude earthquake in the night, which has killed at least 297 people and devastated dozens of houses in the Lazio village of Amatrice. PESCARA DEL TRONTO, ITALY – AUGUST 25: A damaged car is seen after a strong earthquake hit Pescara del Tronto, Italy on August 25, 2016. 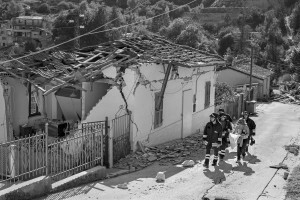 Italy was struck by a powerful, 6.2-magnitude earthquake in the night, which has killed at least 297 people and devastated dozens of houses in the Lazio village of Pescara del Tronto. 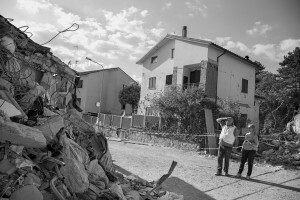 PESCARA DEL TRONTO, ITALY – AUGUST 25: A man stands near a destroyed building after a strong earthquake hit Pescara del Tronto, Italy on August 25, 2016. 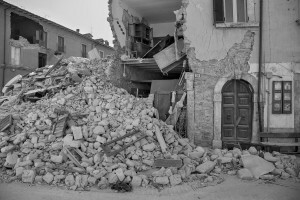 Italy was struck by a powerful, 6.2-magnitude earthquake in the night, which has killed at least 297 people and devastated dozens of houses in the Lazio village of Pescara del Tronto. 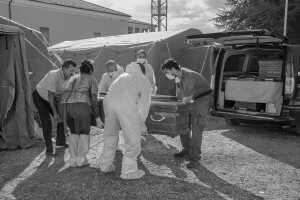 AMATRICE, ITALY – AUGUST 26: Staff of Italian Civil Defense prepare coffins for the people dead after a strong earthquake hit Amatrice, in Italy on August 26, 2016. 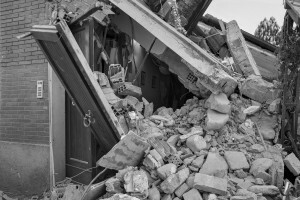 Italy was struck by a powerful 6.2 magnitude earthquake in the night of August 24, 2016, which has killed at least 297 people and devastated dozens of houses in the Lazio village of Amatrice, Pescara del Tronto and Accumoli. AMATRICE, ITALY – AUGUST 28: Buildings destroyed in Amatrice, in Italy on August 28, 2016. 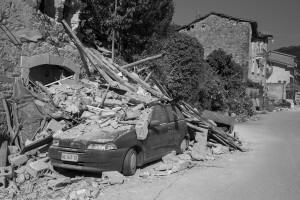 Italy was struck by a powerful, 6.2 magnitude earthquake in the night of August 24, 2016, which has killed about 297 people and devastated dozens of houses in the Lazio village of Amatrice, Pescara del Tronto and Accumoli. 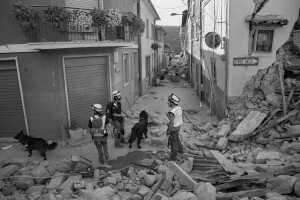 LAZIO, ITALY – AUGUST 24: A dog searches for victims in the rubble after a strong earthquake hit Amatrice on August 24, 2016. Italy was struck by a powerful, 6.2-magnitude earthquake in the night, which has killed at least 297 people and devastated dozens of houses in the Lazio village of Amatrice. AMATRICE, ITALY – AUGUST 26: A couple crying inside a gym after a strong earthquake hit Amatrice, Italy on August 26, 2016. 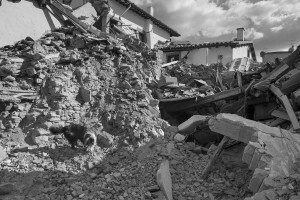 Italy was struck by a powerful 6.2 magnitude earthquake in the night of August 24, 2016, which has killed at least 297 people and devastated dozens of houses in the Lazio village of Pescara del Tronto, Amatrice and Accumoli. AMATRICE, ITALY – AUGUST 26: Volunteers at work inside a gym after a strong earthquake hit Amatrice, in Italy on August 26, 2016. 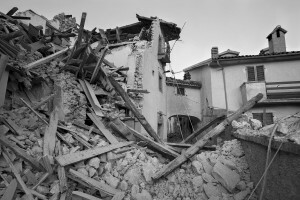 Italy was struck by a powerful 6.2 magnitude earthquake in the night of August 24, 2016, which has killed at least 297 people and devastated dozens of houses in the Lazio village of Pescara del Tronto, Amatrice and Accumoli. 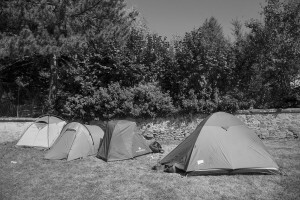 AMATRICE, ITALY – AUGUST 26: Tents are seen inside a temporary camp sets inside municipal park “Father Giovanni Minozzi” in Amatrice, Italy on August 26, 2016. 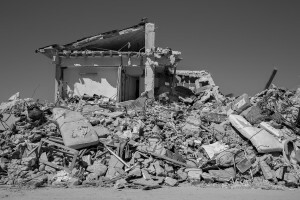 Italy was struck by a powerful, 6.2 magnitude earthquake in the night of August 24, 2016, which has killed at least 247 people and devastated dozens of houses in the Lazio village of Pescara del Tronto, Amatrice and Accumoli. 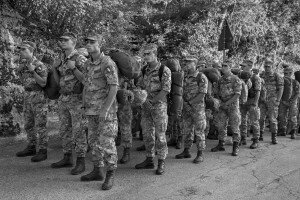 PESCARA DEL TRONTO, ITALY – AUGUST 26: Military are seen in mission in Pescara del Tronto, Italy on August 26, 2016. 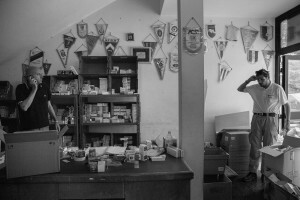 Italy was struck by a powerful, 6.2 magnitude earthquake in the night of August 24, 2016, which has killed at least 247 people and devastated dozens of houses in the Lazio village of Pescara del Tronto, Amatrice and Accumoli. VILLANOVA, ITALY – AUGUST 27: Buildings destroyed in Illica, near Villanova in Italy on August 27, 2016. Italy was struck by a powerful 6.2 magnitude earthquake in the night of August 24, 2016, which has killed at least 297 people and devastated dozens of houses in the Lazio village of Pescara del Tronto, Accumoli and Amatrice. 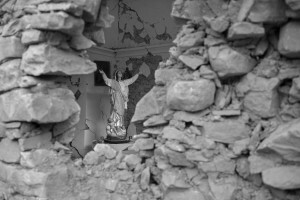 COSSITO, ITALY – AUGUST 28: A statue of the Madonna is seen inside a church damaged by earthquake in Cossito, in Italy on August 28, 2016. 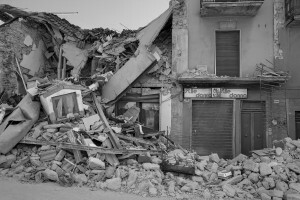 Italy was struck by a powerful, 6.2 magnitude earthquake in the night of August 24, 2016, which has killed about 297 people and devastated dozens of houses in the Lazio village of Amatrice, Pescara del Tronto and Accumoli. 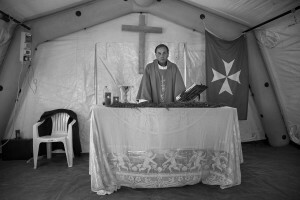 AMATRICE, ITALY – AUGUST 28: Domenico Pompili, Bishop of Rieti is seen during a mass inside a tent in Amatrice, Italy on August 28, 2016. 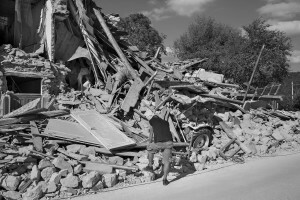 Italy was struck by a powerful, 6.2 magnitude earthquake in the night of August 24, 2016, which has killed about 297 people and devastated dozens of houses in the Lazio village of Amatrice, Pescara del Tronto and Accumoli. PESCARA DEL TRONTO, ITALY – AUGUST 25: A woman with fire fighters reach her destroyed house after a strong earthquake hit Pescara del Tronto, Italy on August 25, 2016. 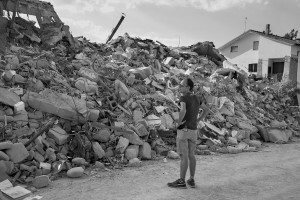 Italy was struck by a powerful, 6.2 magnitude earthquake in the night of August 24, 2016, which has killed at least 297 people and devastated dozens of houses in the Lazio village of Pescara del Tronto, Accumoli and Amatrice. 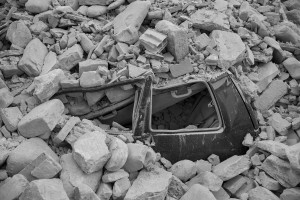 LAZIO, ITALY – AUGUST 24: A car crushed by rubble after a strong earthquake hit Amatrice on August 24, 2016. Italy was struck by a powerful, 6.2-magnitude earthquake in the night, which has killed at least 297 people and devastated dozens of houses in the Lazio village of Amatrice. AMATRICE, ITALY – AUGUST 26: People looks at buildings destroyed in Amatrice, in Italy on August 26, 2016. Italy was struck by a powerful, 6.2 magnitude earthquake in the night of August 24, 2016, which has killed at least 297 people and devastated dozens of houses in the Lazio village of Pescara del Tronto, Accumoli and Amatrice. ASCOLI, ITALY – AUGUST 27: Relatives attend a funeral mass for victims of the recent Italian earthquake on August 27, 2016 in Ascoli Piceno, Italy. 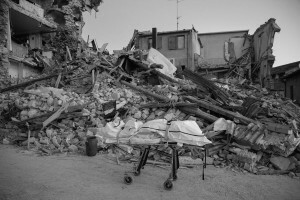 Italy was struck by a powerful, 6.2 magnitude earthquake on August 24, 2016, which has killed at least 297 people, injured more than 400 and devastated dozens of houses in the Lazio village of Pescara del Tronto, Accumoli and Amatrice. 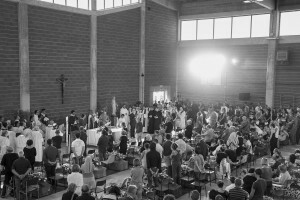 ASCOLI, ITALY – AUGUST 27: The funeral mass for victims of the recent Italian earthquake on August 27, 2016 in Ascoli Piceno, Italy. Italy was struck by a powerful, 6.2-magnitude earthquake on August 24, 2016, which has killed at least 297 people, injured more than 400 and devastated dozens of houses in the Lazio village of Pescara del Tronto, Accumoli and Amatrice. ASCOLI, ITALY – AUGUST 27: A woman cries during the funeral mass for victims of the recent Italian earthquake on August 27, 2016 in Ascoli Piceno, Italy. Italy was struck by a powerful, 6.2 magnitude earthquake on August 24, 2016, which has killed at least 297 people, injured more than 400 and devastated dozens of houses in the Lazio village of Pescara del Tronto, Accumoli and Amatrice. AMATRICE, ITALY – AUGUST 26: A man looks at destroyed buildings in Amatrice, in Italy on August 26, 2016. 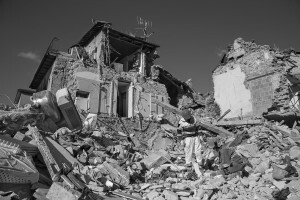 Italy was struck by a powerful, 6.2 magnitude earthquake in the night of August 24, 2016, which has killed at least 297 people and devastated dozens of houses in the Lazio village of Amatrice, Pescara del Tronto and Accumoli. LAZIO, ITALY – AUGUST 24: The body of a person dead is seen on a stretcher after a strong earthquake hit Amatrice on August 24, 2016. Italy was struck by a powerful, 6.2-magnitude earthquake in the night, which has killed at least 297 people and devastated dozens of houses in the Lazio village of Amatrice.